A corn mill has existed on this site for more than a thousand years. One of the four mills in Wheathampstead Manor that are listed in the Domesday book (1086) stood here. The present structure, which is remarkable for its length, is a three-bay, timber-framed building. The oldest central part dates from the late 16th century. The river flowed through the building to power the mill wheel. The original external weatherboarding was replaced with brick between 1890 and 1895. The Mill was originally owned by Westminster Abbey and tenants can be traced back to 1500. Local Dissenters met here, possibly including John Bunyan (1628-1688), author of 'The Pilgrim's Progress'. There is a pub named after him in Coleman Green Lane on the east side of the parish, near the ruins of a 17th century cottage (Grade II listed) where he preached from time to time. The present owners of the Mill, the Titmuss family, bought it from Viscount Kilcoursie of Wheathampstead House (Lord Cavan) in 1882. 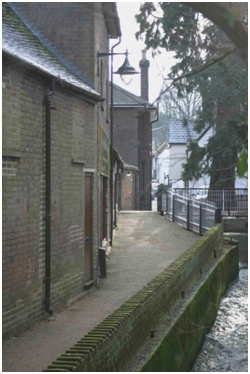 You may like to stroll along Mill Walk (left), which runs behind the Mill alongside the bypass channel of the mill. A magnificent Wellingtonia stands at its southern end. This species of redwood tree was first cultivated in Britain in 1853 and was named after the Duke of Wellington, victor over Napoleon at Waterloo in 1815, who died in 1852.